Unit: $0.25 lb Pallet: $0.20 lb 3+ Pallet: $0.18 lb Natural buff and earth tone sandstone. (30 sq ft/ton dry stack) (45 sq ft/ton with mortar joint) COVERAGE BASED ON SINGLE SIDE FACING (length x height). Unit: $0.31 lb Pallet: $0.25 lb 3+ Pallet: $0.22 lb Reddish brown sandstone with lichens. Thin field 1”-3”. Thick field 3”-5”. (15-25 sq. ft/ton) COVERAGE BASED ON SINGLE SIDE FACING (length x height). Unit: $0.22 lb Pallet: $0.20 lb 3+ Pallet: $0.16 lb Light buff to rust yellow and green limestone. 8” – 24” diameter. Available in 2”, 3”, 4” or small stack. (15-25 sq. ft/ton) COVERAGE BASED ON SINGLE SIDE FACING (length x height). Unit: $0.35 lb Pallet: $0.28 lb 3+ Pallet: $0.25 lb Full color bluestone. Rolled and tumbled. 1½” – 2 ½” thick. (20-25 sq. ft/ton) COVERAGE BASED ON SINGLE SIDE FACING (length x height). Unit: $0.35 lb Pallet: $0.28 lb 3+ Pallet: $0.25 lb Dark purple sandstone. Rolled and tumbled. 1½” – 2 ½” thick. (20-25 sq. ft/ton) COVERAGE BASED ON SINGLE SIDE FACING (length x height). Unit: $0.23 lb Pallet: $0.18 lb 3+ Pallet: $0.16 lb Light to dark gray dolomite. 8” – 20” diameter. Available in 2”, 3”, 4” or small stack. (18-26 sq. ft/ton) COVERAGE BASED ON SINGLE SIDE FACING (length x height). 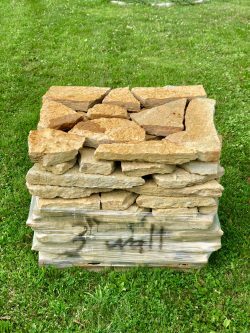 Unit: $0.21 lb Pallet: $0.19 lb 3+ Pallet: $0.17 lb 8+ Pallet: $0.16 lb Eggshell to white irregular limestone. (15-25 sq. ft/ton) COVERAGE BASED ON SINGLE SIDE FACING (length x height). 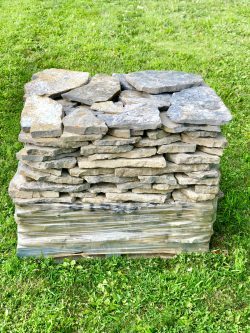 Unit: $0.27 lb Pallet: $0.20 lb 3+ Pallet: $0.18 lb 8+ Pallet: $0.17 lb Medium to dark gray-green limestone with red and lavender bed color. (15-25 sq. ft/ton) COVERAGE BASED ON SINGLE SIDE FACING (length x height). Unit: $0.23 lb Pallet: $0.20 lb 3+ Pallet: $0.18 lb Light gray limestone with a slight olive hue. (20 sq. ft/ton) COVERAGE BASED ON SINGLE SIDE FACING (length x height). Unit: $0.17 lb Pallet: $0.14 lb 3+ Pallet: $0.13 lb Limestone from local creek beds. Random sizes. (20-25 sq. ft/ton) COVERAGE BASED ON SINGLE SIDE FACING (length x height). *COVERAGE FOR MOSAIC BASED ON SQUARE FOOTAGE (length x width).